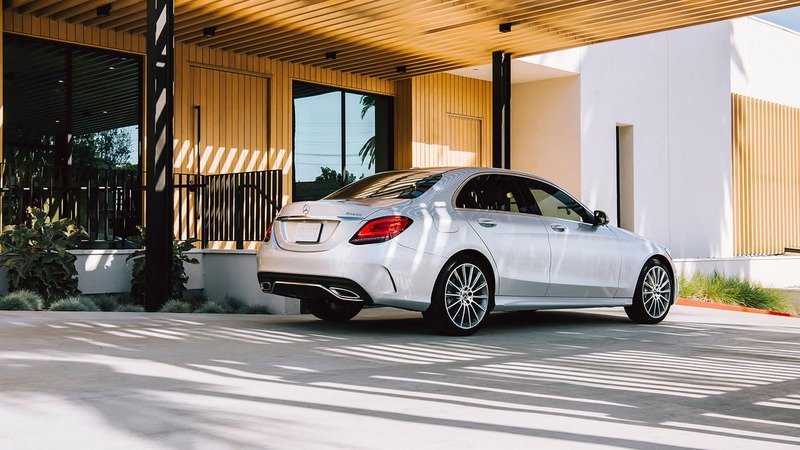 Elegance meets performance in the 2019 Mercedes-Benz C-Class Sedan. With seating for five, the four-door sedan provides premium comfort and safety for all. This model supports just one trim that has everything you need with the C 300 4MATIC Sedan. A low profile and wide stance create a strong impression for the 2019 Mercedes-Benz C-Class Sedan. Eye-catching design begins with the chrome diamond-block grille and sculpted lower body. LED headlamps and new LED taillamps light up the night while the long hood enhances the athleticism of this model. Relax inside the luxurious cabin of the 2019 Mercedes-Benz C-Class Sedan. Power front seats feature four-way lumbar support and memory while the driver’s seat offers thigh support. Automatic climate control ensures the perfect temperature for you and your front passenger. Modern technology enhances the driving experience for the 2019 Mercedes-Benz C-Class Sedan. Mercedes me Assist Services makes it easy to schedule service from your smartphone and to provide diagnostic data on your vehicle. Keep track of important information for your sedan with the 12.3-inch screen with an analogue readout. Choose the 7-inch central display or upgrade to the 10.25-inch version, which allows you to have split screens and display multiple functions. Make the 2019 Mercedes-Benz C-Class Sedan your own with the right accessories. Add a carbon-style rear spoiler or mirror covers for a unique look. Enhance the versatility of this model with features like a folding table for the rear seat. All these accessories are designed to work specifically with this model. 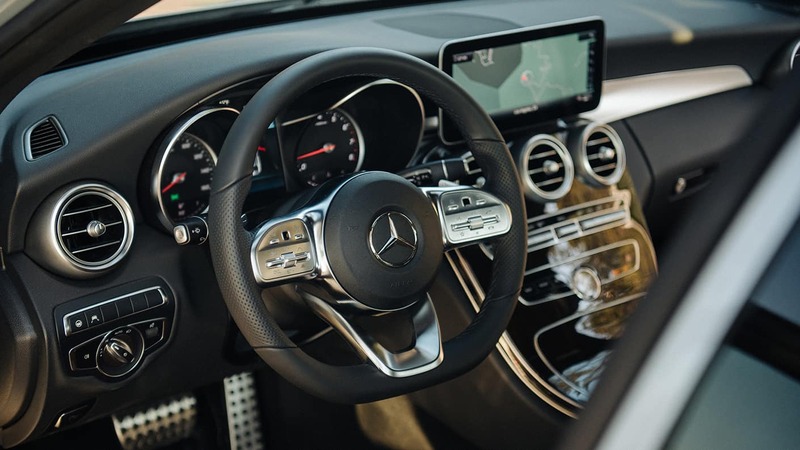 You’ll enjoy being behind the wheel of the 2019 Mercedes-Benz C-Class Sedan with its turbo engine and nine-speed automatic transmission for smooth control. Thanks to shift paddles, you feel like you’re driving a manual as you decide when to shift gears. Dynamic Select allows you to choose from five driving modes to suit the situation and your mood. As an all-wheel drive, you can feel confident in getting around in all kinds of weather. 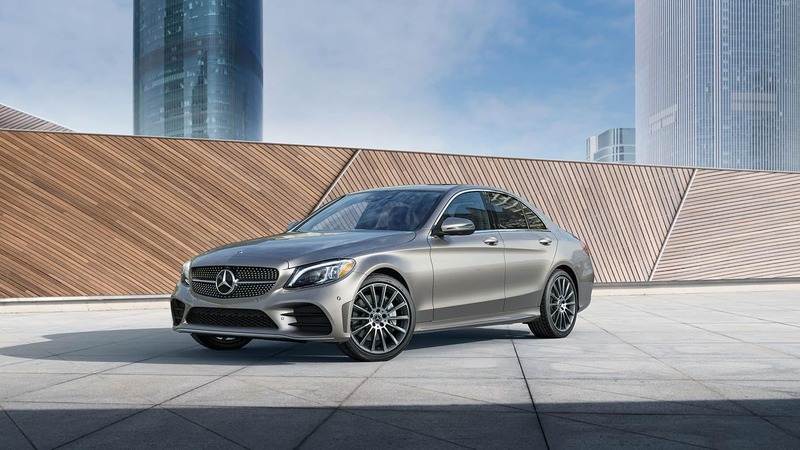 Critics are impressed with what the 2019 Mercedes-Benz C-Class Sedan has to offer. Feel peace of mind as you drive the 2019 Mercedes-Benz C-Class Sedan, knowing it comes with advanced safety features. Every 2019 Mercedes-Benz C-Class Sedan comes with an outstanding warranty. The 2019 Mercedes-Benz C-Class Sedan is sure to impress. With unbelievable elegance and comfort along with exceptional performance and safety, this sedan will take you everywhere you want to go in style. Thanks to features like all-wheel drive, you can do more than ever before in a luxury car. Come into your local Edmonton Mercedes-Benz Dealer – Mercedes-Benz Edmonton West to see the 2019 Mercedes-Benz C-Class Sedan. Take it out for a test drive to see how well it handles or talk to the sales team at Mercedes-Benz Edmonton West to choose your options and get the car you want with this model or any of our outstanding Mercedes-Benz vehicles today.